A quick search for “meatballs” around these parts yields many a rotund result. We’ve got plenty of the chicken variety rolled in everything from teriyaki sauce to Buffalo sauce. 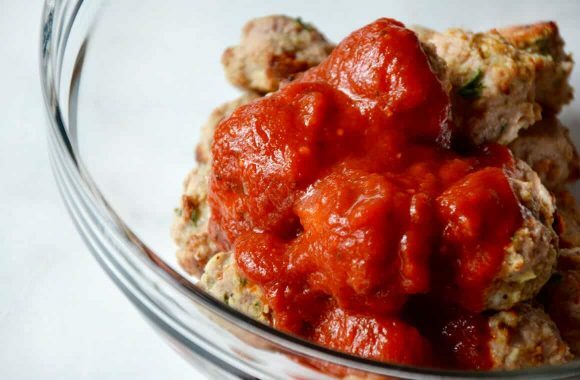 But I’m swapping up the poultry game with this quick and easy recipe for baked turkey meatballs coated in classic marinara sauce and piled high atop a bed of pillowy quinoa. Consider this recipe to be a lighter take on an Italian comfort food favorite. We’re bypassing the ground beef and skipping the spaghetti but still packing a whole lot-o-flavor into each spherical bite. Breadcrumbs soaked in milk help seal in the moisture, while baking the meatballs in a mini muffin pan guarantees golden brown color across the board (but a baking pan works well, too!). Keep this recipe as homemade or as store-bought as your heart desires by whipping up my 10-Minute Marinara Sauce or popping open your go-to jar of red sauce. And as long as we’re talking time, these turkey meatballs will be on your table in a speedy 30 minutes. Flavorful, fast and filling. What more could you need in a meatball or a meal? All that’s left to do is toss together a quick salad and consider dinner done. P.S. Willing to splurge on a side dish? Don’t miss my Secret Ingredient Cheesy Garlic Bread! Preheat the oven to 500°F. Generously grease a baking dish or nonstick mini muffin pan with cooking spray. In a small bowl, stir together the milk and breadcrumbs and let the mixture sit for 5 minutes. 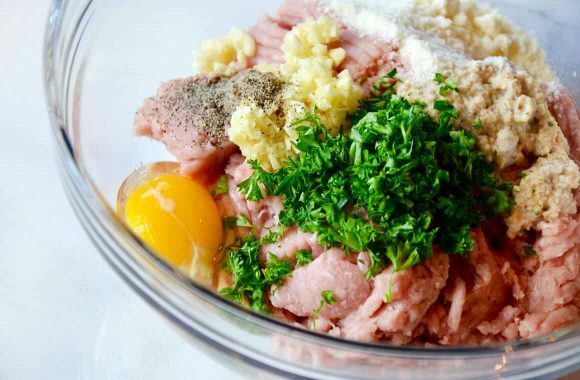 In a large bowl, combine the ground turkey, breadcrumb mixture, egg, minced garlic, chopped parsley, grated Parmesan, 1/2 teaspoon salt and 1/4 teaspoon pepper. 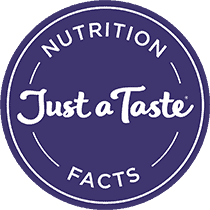 Use your hands to thoroughly combine the mixture and then shape it into balls using 2 to 3 tablespoons of meat per meatball. 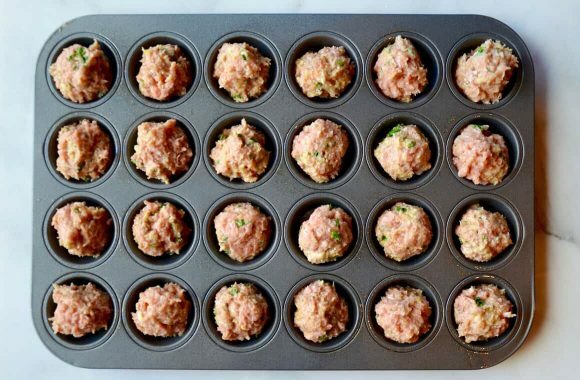 Arrange the meatballs in a single layer in the prepared baking dish or nonstick mini muffin pan. Bake the meatballs for 15 minutes until they are cooked through. 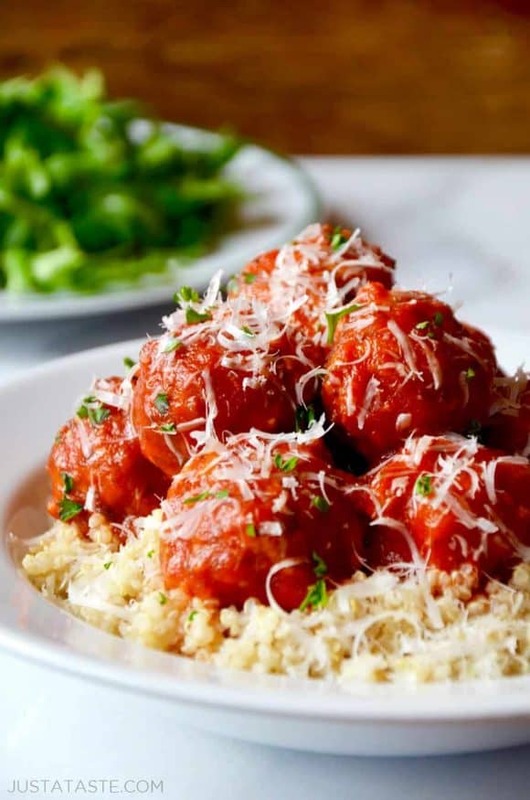 When ready to serve, divide the quinoa among plates then place the meatballs on top. 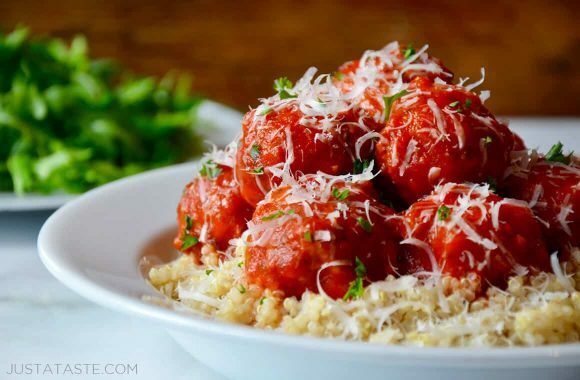 Spoon the marinara sauce over the meatballs and garnish with grated Parmesan cheese.